When Donald Trump went to war against a global women’s group, he made the mistake of believing his own women-marginalizing narrative. Women around the world are now rising up and opposing this misogynistic monster who abuses and kills children. Trump says he is an ultra nationalist. His rabble-rousing conduct appears fascist not nationlistic, but the words may mean the same things. It takes a bit of education and a good understanding of history to appreciate the popular comparisons of Trump to other fascists by America’s intellectual elite which group has been scribing furiously through much of 2018. May I dare put this in simple terms? The number of people Trump is able to impact in a deleterious manner, far exceeds what harm Hitler could do in his time. Moreover, Hitler’s political career spanned 12 years as Chancellor of Germany and the Fuhrer of Nazi Germany from 1933 to 1945. Trump has only been in politics for less than 22 months. his attacks on individuals has been getting many people killed. The American President’s painfully cavalier attitude to his collusion in the killing of dozens of children in Yemen on 9 August is not going to be ignored. His US Navy blockade of humanitarian aid to Yemen partnered with Mohammad bin Salman, Omar al-Bashir, and Khalifa bin Zayed Al Nahyan, which daily looks more like a racist, genocidal conspiracy, has killed tens of thousands of civilians. There is no excuse for this slaughter of thousands already and pending millions, another holocaust in the making. Everything changed as Trump came into office. We watched in horror at the edge of Tamuz in Mosul Iraq as a basement full of civilians using one of our water filtering pumps was hence congregated together to survive the “liberation” from ISIS by being below ground. They were all massacred. The children, mothers, babies, we knew and cared for were with devastating results bombed by the US Air Force on demand by the Iraqi Gold Division which thought it saw a sniper on that street. One such Iraqi soldier mocked me. “I tot I taw a putty tat”. This sort of thing never happened before Trump. The American service crews were very careful before Trump came to office. They earned a lot of respect before that day. Then it ended. Now they help kill babies in Yemen. Trump needs to compensate the families (see Survivor Compensation) as we asked on their behalf on the day of the funeral, 13 August, 2018, 3 months ago. It is not a lot of money but it is a horrendous blemish on US Forces who Trump has made to look like very, very disgusting. Trump’s naval warship blockade of the people of Yemen over the past three years or more has jeopardised the lives of 1.3 million who now are infected with cholera; and another 8 million Yemenis, which living group, is being whittled down in numbers by malnutrition and outright starvation if not by bombs. You can read more here of Katie Alsop’s comments. Plaintiffs in a class legal action pending against the USA contend that Defendant, the United States of America, was entered into a contract with other defendants to act as a whole to kill civilians by military means for the purpose of terrorizing the Yemeni people into submission to governance by the defendants. Trial jurisdiction of this cause of action may be set by the plaintiff. The plaintiff is a class of Yemeni people. The plaintiff claims damages in the amount of $1,227,430.00 for each child killed on 9 August at the Dahyan Market and no less than $50k up to $950k to any person in Sa’dah Governorate of Yemen who joins the class and claims a remedy. In letters and in public statements The RINJ Foundation clearly explained to the titular head of state of the United States of America that, in case it did not know the facts, that its target acquisition, tracking and weapons guidance done explicitly to assist Saudi Arabian males flying US-built aircraft carrying US-made 500lb bombs and other war weapons, killed dozens of young children in a school bus in Yemen. 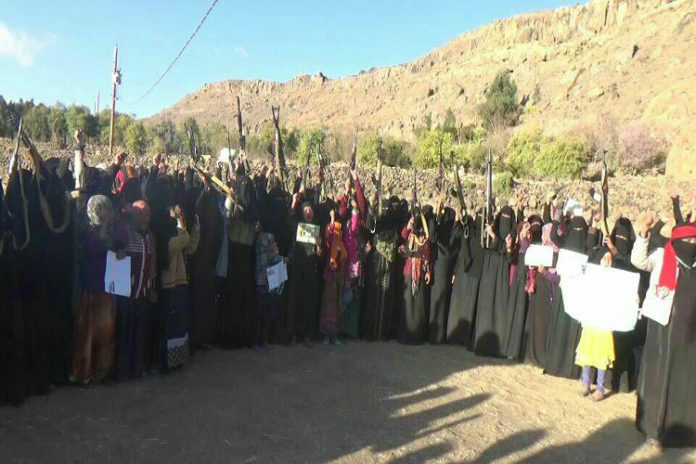 UN sources part of a September investigative team have told Feminine Perspective that all sides have commit serious war crimes in the Yemen conflict. The preliminary report of the group said that coalition air strikes caused “most of the documented civilian casualties” and illuminated “serious concerns about the targeting process”. RINJ Investigators determined Dahyan Attack was no accident. This attack against a children’s school bus in Dahyan, Sa’dah Governorate, Yemen was done with video-imaging laser-guided bombs. In simple terms an American team supporting what is known as the Saudi Arabian expeditionary forces could see what they were striking and did strike a Yemeni children’s school bus which the driver had stopped to pick up children’s refreshments on a hot, clear, day in a busy market. Satellite imagery is capable of reading the writing on a yellow pencil protruding out of a shirt pocket and determining if it is an ‘HB’ or ‘2H’ pencil. That sky at the material time was clear and visibility was unlimited. American and Saudi combattants knew, unequivocally, they were bombing a school bus full of children. American young service crew may have protested but the Saudi’s gave the order to proceed and bomb the school bus. Since the afternoon of 9 August The RINJ Foundation War-Crime investigators have in four different countries with files from others have determined that the school bus bombing was no accident and that the crime is consistent with hundreds of others since March 2015. These authoritarian leaders , while unlawfully using the apparatus of their nation states to carry out attacks driven by their personal hatreds, conspired and convened deliberation and thereafter with willful intent did kill Yemeni civilians using military means. They especially killed those Yemeni civilians they think are associated with the Ansar Allah religious fundamentalist rebellion which now governs Yemen and has done so since early 2015. The Yemeni civilians these men are slaughtering, they claim are aligned with Iran and thereby “deserve to die”, according to their doctrine. The beliefs and concomitant tactics of this so-called Coalition (of Donald Trump, Mohammad bin Salman, Omar al-Bashir, and Khalifa bin Zayed Al Nahyan) which daily looks more like a racist, genocidal conspiracy, has killed tens of thousands of civilians. This collection of the worst monsters in history (because they have the impunity unlimited money can buy), has jeopardised the lives of 1.3 million who now are infected with cholera; and another 8 million Yemenis which living group is being whittled down in numbers by malnutrition and outright starvation if not by bombs. That will predictably continue until they are gone. Just as Mohammad bin Salman has persecuted and killed Shi-ite Muslims in Saudi Arabia with the help of Donald Trump and others, these men, using various state-owned apparatus, are killing all the Shi’ite Muslim civilians in Yemen, which once had a population of 30 million. The Saudis first claimed the 9 August attack as “a legitimate military action” against Houthi who they said were using children as human shields. Following considerable pressure from Civil Society and from ‘Coalition’ partners against Yemen, Saudi Arabia more or less apologised on 1 September saying the attack on the kids was a mistake. It wasn’t. Our investigators say unambiguously it was intended as has happened before. You can read the Saudi statement here. The United States has sent a Blackwater descendant mercenary group into Yemen, some of whose mercenaries are known to RINJ Investigators and security types, and they are assassinating Ansar Allah Clerics at a significant pace. RINJ investigators estimate 26 Clerics have been murdered this year which further implies that this is a matter of religious rivalry and hatred which the US has involved itself up to its collective eyeballs. The pattern of racism and genocide up to the fourth year of this joint military operation against Yemeni civilians is conclusive. This attack comprised of the United States backing the Kingdom of Saudi Arabia (KSA) as a surrogate along with Saudi Arabia’s friends and neighbours (some of which no Western country should ever be aligned with, like Sudan), that invades one of the poorest countries on Earth, is intended to wipe out the Shi’ites in Yemen. That is predicted to happen soon. By withdrawing from the United Nations Human Rights Council (UNHRC) in mid-2018, Donald Trump tacitly admitted that the United States not only was committing significant human rights violation but intends to do worse. This opens a pandora’s box of human rights grievances around the world. This also puts a burden of overwatch on Civil Society thus closing a chapter in history wherein America was once a champion of human rights. Murdering and dismembering your country’s journalists would normally get a powerful reaction from the White House. But Donald Trump has labelled journalists as the “enemy of the people” hence the death of Washington Post commentator Jamal Khashoggi, is a non-event for Trump and his more radical supporters. This murder could have been anticipated when the Saudi Crown Prince told Trump in advance that he would be kidnapping Khashoggi. There is no love lost between Donald Trump and the Washington Post one of whose journalists wrote a scathing book about Trump. The writers at Feminine-Perspective Magazine and others have suggested that Trump probably signed off on the abduction of Khashoggi because of his loathing for the Post. Without a doubt, Trump’s conduct is extremely suspicious. It is certainly immoral and likely unlawful. Trump also tells the public lies when he says that he is unconditionally backing Saudi Arabia because military sales to the KSA bring jobs to America. It is simply not true. There is a high probability that not one job is created. The entire defence industry including the companies that make bombs, guns, uniforms, medical booties, t-shirts, brooms for sweeping and other supplies, comprise in total, 0.5% of the USA work force. The estimated 1,477,896 active and 1,458,500 reserve personal in the US Armed Forces are well below 50% readiness and the bombs and guns they need to do their jobs are being sold to Saudi Arabia with no value added to the United States because the cost in commissions and payoffs makes the sales barely profitable to the American people. There is another factor. The United States is responsible for the cost of what damage its weapons cause in the hands of people acting as USA surrogates. Nobody knows yet what that dollar amount will be. Maybe it will only be double or more the skim of Washington DC lobbyists. Saudi Arabia is giving Donald Trump’s business organizations many hundreds of thousands of dollars per year through various back-door methods. Trump himself claims that Saudi Arabia pays hundreds of billions of dollars for US weapons that it has used to kill tens of thousands of civilians in Yemen and to destroy the infrastructure of the country, even to the point of killing white coats (doctors, nurses, medics) and destroying access by humanitarian food and medicine shipping. The Plaintiffs must “follow the money”, says Katie Alsop of The RINJ Foundation. The money says Donald Trump is flowing into America. America’s equivalent to a government Cleric, Pat Robertson said this week about the murder and dismemberment of American resident Jamal Khashoggi, “it’s not worth jeopardizing $100 Billion worth of arms sales” which some on Social media accounts have interpreted to mean, ‘kill as many Muslims as you can’. And they say that. The RINJ Foundation, fighting for the safety of women and children warned the coalition that it should cease fire, leave Yemen, and compensate families of the slaughtered children. This week the American/Saudi Coalition against Yemen bombed a produce packaging facility in the outdoor food market in the town of Bayt el-Faqih, just south of the port city of Hodeida, wounding as many as three dozen civilians including children. The number of deaths were reported differently each day since because of chaos caused by continued attacks on civilians, hospitals, funerals, weddings and other community events that have overloaded the medical care infrastructure. Many critically injured patients are not surviving. In Al Hali District in Hodeida province, the UN’s Office for the Co-ordination of Humanitarian Affairs said on Thursday that another attack had been launched against civilians. Details are still sketchy. Bayt el-Faqih hospital’s, Abdullah Shahawi, said all the victims were civilians and at least two children were among the dead so far. The Board of Directors of The RINJ Foundation has instructed its Chief Executive Officer (CEO) to explore and execute as supporters of Plaintiffs or as Plaintiffs as soon as reasonably possible, a legal action to seek compensation for the Plaintiff parties. As a result, the organization has determined initial guidelines indicating the Plaintiff Class should seek financial damages in the amount of $1,227,430.00 for each child killed on 9 August at the Dahyan Market and no less than $50,000 up to $950,000 to any person in Sa’dah Governorate of Yemen who joins the class and claims remedy in accordance with their loss. “Additional information will be forthcoming from legal counsel.” said Katie Alsop spokesperson for the RINJ Board of Directors. Yemen is governed by Ansar Allah which is a group also called The Houthis named after the family that founded Ansar Allah. As such the Ansar Allah group is a grass roots rebellion against a Saudi-US puppet government that the Yemenis did no like because of its horrible corruption and alliances with people like those of the Islamic State. The grass roots rebellion took place at the end of 2014 and continued to the spring of 2015 when the USA and Saudi Arabia invaded Yemen and tried to reinstall their preferred government. It’s not hard to speculate that Americans dislike Iranians. America is a very racist nation. Like some steadfast monolith that Moses climbed, the United States keeps touting a Christian God as its source of righteousness for no end of murderous crimes. God was cited by US President George W. Bush as the US entered Iraq and killed a million Iraqis since 2003. The irony of that is that the United States was attacking other countries because of those nations’ proclivity to colocate Allah as a national leader with their human authoritarian dictator. What’s the difference? In either case the distinction between church and state is non-existent. America hates Iran for those same reasons. Plus there’s the fact that Iranians are dark skinned and Muslim and are not allowed under Donald Trump to come to the United States, or he will confiscate their babies and worse. The 9th century Persian mathematician Muhammad Ibn Musa-al-Kharazmi created the Logarithm table, developed algebra and expanded upon Persian and Indian arithmetic systems says Wikipedia. The 20th century Iranians developed nuclear reactors and the know-how to build atomic bombs. The 21st Century Iranians made Iran the 9th country to put a domestically-built satellite into orbit using its own launcher, and the sixth nation to send animals into space. In short, Iran is a player. It is a developed nation with huge resources in intelligencia, academia, science and medicine. Iraq invaded Iran on 22 September 1980, backed by America. Over one million Iranians were killed. Iraq losses are estimated around 300,000, but Iraq’s invasion was for nought and the war was of no consequence except death. Today, it is a de facto reality that Iran completely controls Iraq’s government owing to American violence and missteps in the region. Iran comfortably could get along with any nation except Saudi Arabia. The two countries have a foolish dispute that goes back to the fifth century and the in-laws of Islam’s founder, the prophet Muhammad (571AD-632AD). According to Islamic doctrine, Muhammad was God’s messenger, sent to present and confirm the monotheistic teachings preached previously by Adam, Abraham, Moses, Jesus, and other prophets all of whom were violent opponents of polytheists. None of them make any sense to scientists who study the universe. They indicate the mysteries of the universe are far more interesting and will yield much more for the children the modern-day subscribing followers to any of Muhammad’s alleged successors do not kill. The Trump policy of confiscating and separating babies and children from migrant mothers has received plenty of scorn from around the world but none as potent as what has come from US Courts. Apparently Trump feels he is above the law on many issues. Certainly he does not appear to care about anyone’s children. Repeatedly the Trump Administration has failed to comply precisely with the order of a US Court which ruled in favour of the American Civil Liberties Union (ALCU) which had filed a class action against the US Government for confiscating children from their families and not even keeping proper records of where the babies and children truly belonged. You can read the Trump Administration’s submission here: Court Submission October 25 US-Immigration-and-Customs-Enforcement. The judge at Thursday’s status hearing said the full reunification of children with their families which through Trump’s drift-and-delays has been overdue for months would close by 9 November 2018. Donald Trump snatches babies from their mother’s arms. 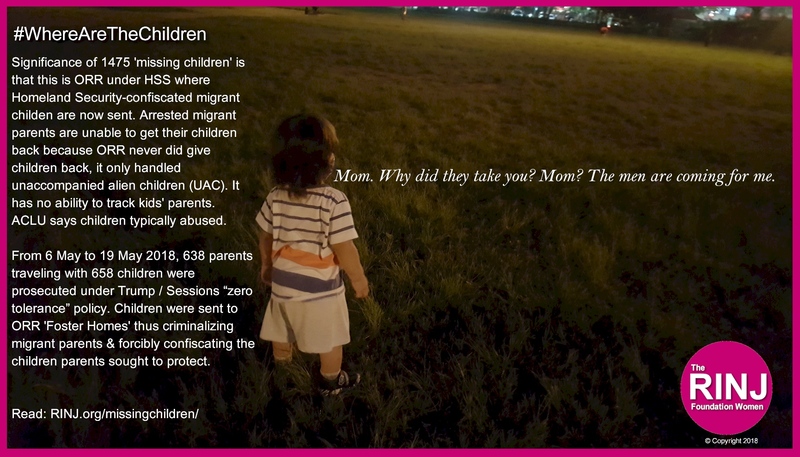 What happens to the children after that is a horror story says the ACLU. Photo Credit: Melissa Hemingway, Feminine Perspective Magazine. Donald Trump who once called a breastfeeding mother “disgusting” threatened Ecuador in early 2018 with serious economic sanctions if it continued on its course of promoting breastfeeding over baby formula available from the US $70 billion industry. Ecuador was told to vote against a resolution in Geneva at the United Nations-affiliated World Health Assembly. That discouraging breastfeeding over formula kills babies is categorically proven. The US baby formula industry is in trouble because families in America and Canada are having fewer babies than what is needed to replace the existing population and have also become better educated which results in decisions against using baby formula. As a consequence of this reality the industry has looked to sway mothers in undeveloped nations like the Philippines for example where the birthrate is almost triple what it is in Canada, for example. Encouraging mothers to abandon breastfeeding kills babies. Read more at rinj.org/breastfeeding. Donald Trump has led America to a place the world never thought it would see. Plaintiffs in a class legal action pending against the United States contend that Defendant, the United States of America, was entered into a contract with the other Defendants to act as a whole to kill civilians by military means for the purpose of terrorizing the Yemeni people into submission to governance by the defendants. Trial jurisdiction of this cause of action may be set by the plaintiff. The plaintiff is a class of Yemeni people. The plaintiff claims damages in the amount of $1,227,430.00 for each child killed on 9 August at the Dahyan Market and no less than $50k up to $950k to any person in Sa’dah Governorate of Yemen who joins the class and claims a remedy. Written originally by Micheal O’Brien with files from RINJ contributors around the world.